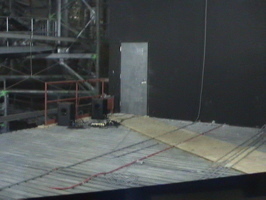 There was a rope separating the taping from normal guests, so the photos are taken from a distance (below, left). Some children were chosen to meet Phineas, Ferb and Stoner (below, right). We were told that Phineas and Ferb are not slated to be part of Walt Disney World’s characters at this time. Phineas poses for the camera (below left and right). Phineas and Ferb pose for a few more photos before taping wraps up for the evening (below left and right). Judging by the reaction they had from guests, Phineas and Ferb would make a terrific addition to Disney’s Hollywood Studios! 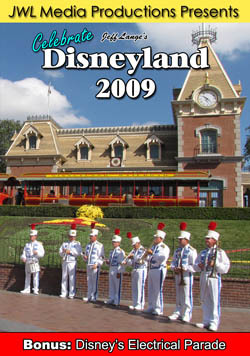 This was only their second visit to the Disney theme parks, the first being the Christmas parade taping at Disneyland. 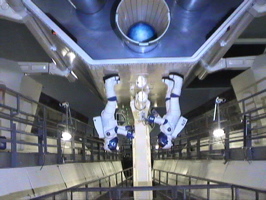 Space Mountain is now in soft openings, I’ve not yet ridden yet but look forward to experiencing it soon. 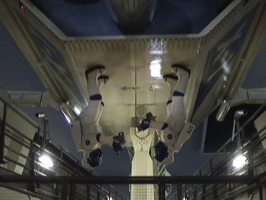 The Spacemen are back at the attraction’s blast off lift hill and are looking better than ever (below left and right). 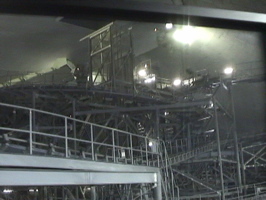 There is a view of the Space Mountain ride track from the People Mover again too (below left and right). The queue line will no longer be visible as it is now fully enclosed. 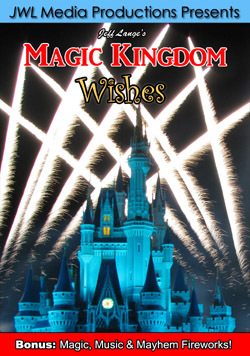 Bonus Videos – Phineas and Ferb (with Alyson Stoner) Visit the Magic Kingdom! 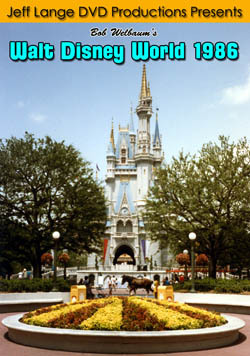 Video #1 – Phineas and Ferb visit the Magic Kingdom, Walt Disney World – Phineas and Ferb made an appearance for D365. 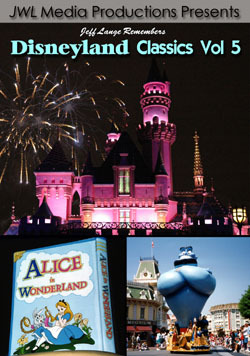 As of this writing they are not yet walk-around characters in any park. Video #2 – Alyson Stoner Visits the Walt Disney World’s Magic Kingdom – Alyson Stoner stopped by the Magic Kingdom, along with Phineas and Ferb to film a promo for D365. Video #3 – Space Mountain Viewed from the People Mover (with Lights On) 11/13/09 – The walls came down between the People Mover and Space Mountain yesterday.